a good life. : goodnight nana. how freaking awesome is skype, right? letting geographically distant grandparents tuck in their grandkids since 2010. So adorable! That must make for a happy nana!! We love Skype! The other night when we were talking to Nana & Papa we gave them a tour of our new place. The girls were super excited that they got to show off their new bedroom. And I had to hide my eyes as I scrolled down and saw the STICKY BUNS!! Ahhhh!!! Trying to fit into size 4 jeans here! LOL! ;-) Have a great week! YAHOOOOOO for SKYPE! We should plan a NIGHT and CHAT IT UP! Love Skype! 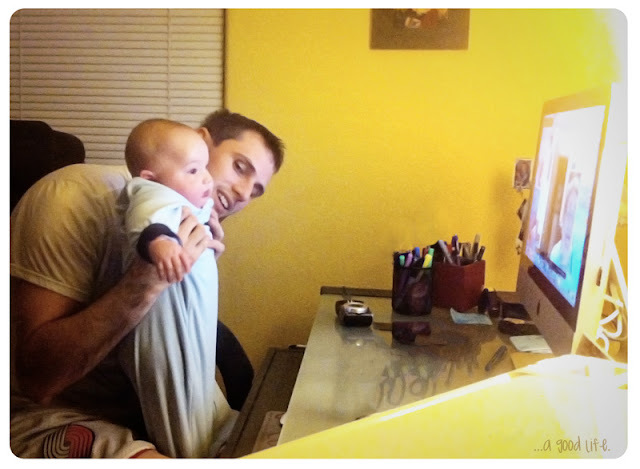 When my husband goes out of town we try to skype every night, it's such a good way for him and Avery to get to see each other even when far apart! Love the pciture, so cute!